How can I not start the post with a picture when this kid is so photogenic?! 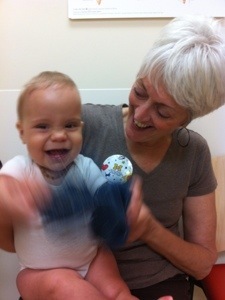 This past Thursday, Colten had his 9-month checkup with the Myelomeningocele Clinic at U of M C.S. Mott Children’s Hospital. At the Myelo Clinic, each patient is put into an exam room and stays there for about three hours. There is a sign outside the door with a long list of departments, such as Neurosurgery, Urology, PM&R (physical medicine & rehabilitation), PT, OT, Speech Pathology, Neurology, Orthopedics, Social Work, and a few others. Each department goes one by one into the rooms. This saves us from having to coordinate multiple appointments – we see everyone we need to see all in a three hour time frame. We’ve been pleased so far with this setup because it gets all the important reviews over and done with. Follow-up appointments are setup as needed and the doctors all seem to truly take their time with Colten, answering any and all questions we bring that day. I think as Colten gets older, it may get more challenging to keep him contained in a single room for three hours, but the Child Life Specialists at Mott are very helpful – they can bring games, iPads, videos, crafts and other things to keep him occupied. Also, the frequency of his appointments will go down to about every six months after he turns a year (hopefully), then possibly just annually after two or three years of age. The whole family trekked down to Ann Arbor for the most recent appointment, but just Colten and I were in the exam room. Richard had an interview at a school in the area and needed some time to work on a final paper for a class. 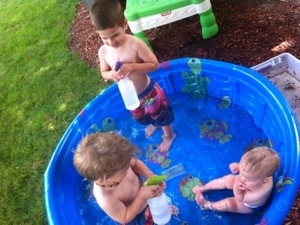 The boys were occupied by my sister, Sarah, and my mom joined Colten and me for the appointments. A second set of ears is always helpful and she was excited about getting to go through Clinic with us. Colten loved playing with his Grammy! Sidenote: Because I could not find this information searching online, I wanted to post it here in case other families are ever looking for it! The indoor playground at U of M Mott Children’s Hospital in Ann Arbor is open at 8:00 AM every day. Children must be accompanied by a guardian. There is a playground, activity centers, action figures, arts and crafts, books, games and more there (I don’t remember if it’s on floor 8 or 12 but I’ll try to check and get back to adjust this if necessary). Also, there is a Family Center that allows you to drop off siblings from 1-4 PM. This is free care and while they prefer children are potty trained, supposedly they will accomodate if possible. They also have games, books, crafts, snacks and more down there. That is on the 2nd floor – or main floor of entry, near the gift shop. AND, if you have an appointment or are admitted, you can get free passes to the Ann Arbor Children’s Hands-On Museum for the day for your family, just ask either someone in Social Work, Family Life, or at the reception desk. Neurosurgery was first and was pleased with Colten’s progress. His incisions are healed up nicely, his fontanel is still open and isn’t filling up with fluid, and there is not much new to report on that end. I made sure to mention Colten’s lip quivering to Dr. Ramnath. It’s not that abnormal, but most babies lip quiver early on and grow out of it by this age. Colten usually only quivers when crying (more typical) but sometimes it just happens. Dr. Ramnath said as long as it is short-lived and no other symptoms occur simultaneously, it’s just him. We should always watch for the possibility of seizures but at this time, we don’t need to worry about the ongoing lip quiver. Next up came Social Work. They are a great resource for putting us in contact with the necessary agencies or answering questions when it comes to Colten’s insurance. The social worker was also the one that informed us of the free childcare at Mott through Family Life (1-4pm), and the free passes to the Ann Arbor Children’s Hands-On Museum. Thanks Jeff! PM&R came in next, but since they were the group with the most information and changes, I will come back to them in a minute… Urology followed and we are fairly status quo there. Colten has follow-up tests in October to monitor his kidney reflux and bladder emptying. They explained some procedures that could be in his future that I won’t get into now because we just don’t know! More to come in October in that department. Onto the BIG changes now. We expected that this visit with PM&R would result in some big things due to his age and some changes and sure enough, it was loaded. Dr. Green is very happy with Colten’s quad strength and wants to capitalize on that sooner rather than later. To do this, she wants him in braces and is recommending Kangaroo AFO’s (ankle-foot orthotic) first. 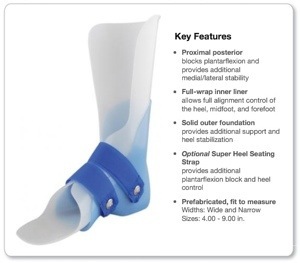 Because he is so young and growing so rapidly, these AFO’s are sized instead of fitted so he can wear them for a few months then move to the next size until he is ready for custom-fitted AFO’s. Since he is only using them for therapeutic purposes (standing/weigh-baring exercises and activities), not actually walking, he will wear them rarely and the cost for custom-braces is rather high. Colten is not showing any indication that he wants to stand and is moving around wonderfully on the floor on his own by rolling, sitting, twisting and rolling some more! So he will use the AFO’s during therapy sessions, which Dr. Green wants him to amp up now. He will go to an outpatient physical therapy program, hopefully right at Sparrow Hospital on Lansing, 1-2 times each week, in addition to our wonderful EarlyOn PT who comes to the house once every two weeks. We asked about using a taping system instead of braces, which we might try just to see how he responds or what he does, if anything, with that. Dr. Green said she feels it will not offer nearly enough support for him to be productive with it. She also noted that taping or bracing will NOT assist him in crawling and he should not wear either during floor time since braces tend to force the foot into outward positions, which forces the knee then the hip into outward positions. Our EarlyOn PT had also suggested we ask about parapodiums, or standers or a swivel walker. Dr. Green said Colten’s not ready yet and she doesn’t prescribe them a lot. She wants him to continue exploring his strengths on the floor. The outpatient PT may use that equipment during therapy sessions but it’s not something we need to use at home for the time being. That was great news for us, as we feel strongly that he needs to further his strength and mobility on the floor still and he isn’t frustrated by his lack of crawling, standing or anything else at this point. As you can probably tell from most of his pictures, he is quite content (putting it mildly)! And he is certainly figuring out how to move around! Also during the PM&R session, we talked with an OT (occupational therapist). 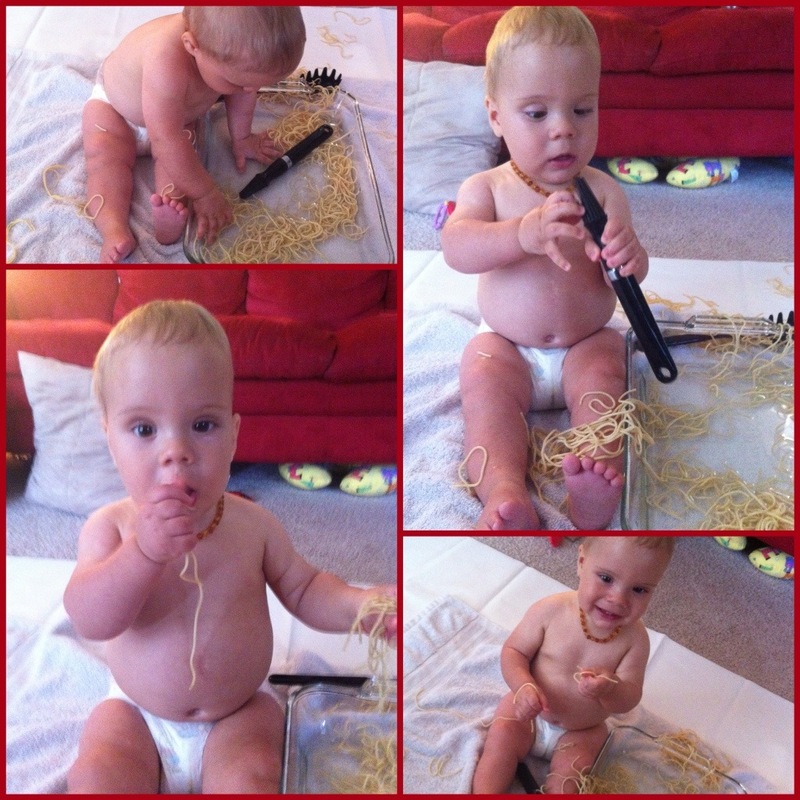 In the simplest of terms, we can kind of think of PT as large motor skills (walking, climbing, etc…) and OT as fine motor skills (pinching, grabbing, eating, etc…). Colten’s chocking and gagging has been a concern of ours recently and is a common symptom of the Chiari II Malformation. While his Chiari Malformation is minor, it is quite possible the chocking and gagging is caused by that, not just his age. He is super sensitive to textures in his food – too thick or chunky, or even too thin (water). The OT suggested doing a swallow study, and giving him more exposure to sensory bins. Apparently playing with multiple textures with hands is helpful for the receptors in the mouth as well. Those areas of the body are very connected in the brain. So instead of jumping into a swallow test, we decided to give it another three months and let him get a bit older and explore the tactile world more to see if we can help him overcome this. We are not done yet! Colten’s head then became the focus of discussion. They noted the extreme scaphocephaly (elongated front to back), the still flattened left side, the narrow back/wider front (should be smaller in front, wider in back) and the unevenness of his ears. The “helmet guy” was with the PM&R entourage and would have liked to fit Colten THAT DAY for his helmet. There were no open appointments so most likely we will head back this week for a fitting, then back again when the helmet is ready. Usually scaphocephaly is due to fusing of the plates; we know Colten’s are not fused after getting a CT Scan a month or so ago. Another reason for scaphocephaly, or any misshapen head, is “position”. While there are MANY reasons a baby might wear a helmet, one of the more common reasons is due to “flat head”. With the Back to Sleep campaign, babies are placed on their backs to sleep or whenever they are given floor time. If babies are not rotated, if they roll late, are left on their backs for an abundant amount of time, the back of their head flattens out. Depending on circumstances, this can sometimes self-correct as babies begin to move around and aren’t stuck on their backs. If it doesn’t correct, helmets are used. In some cases, parents choose to go with a helmet for cosmetic reasons. Some cases are severe enough to alter structures and cause issues within the head though – vision problems, hearing issues, jaw alignment, etc… Helmets are most effective when started under about 8 months of age. The longer you wait, the longer it takes to fix. 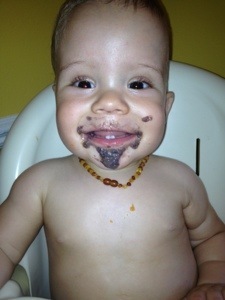 (You may recall that I noted the misshaping at Colten’s 6-month appointment but was kind of blown off.) Scaphocephaly is much harder to correct using a helmet – and we were under the impression it may not even be possible to fix with a helmet. U of M to the rescue though – according to Dr. Green, as U of M INVENTED the helmet, they know it can be used for correcting non-fused scaphocephaly too! So a helmet it is. The hardest part to swallow was when the therapist told us he would wear this for 23 hours a day (we knew that going into it), for EIGHTEEN MONTHS. Eighteen months! Colten will be almost 2 1/2 years by the time this comes off. In the end, it doesn’t matter. We know his head is very elongated and not right at all. We already see the structural issues in his ears, and the past two days his eyes are starting to track differently. So we know this needs to be done to prevent internal cranial complications and if we could go back and start it at 6 months, we would. I mentioned the oversight on Mott’s part to the PM&R team, I told them how the nurse from the Craniofacial clinic told me to just work on adjusting his positioning – and how I felt that was ridiculous for his age and for the most part impossible. They fully agreed on that (which made me happy, but then angry that we didn’t just do something faster then) and said there is absolutely no way this will self-correct and it needs to start ASAP. Colten will still go to his cranial sessions with Dr. Grimshaw – we hope his work, in conjunction with the helmet, results in a shorter overall time period that Colten needs to be in this helmet. Adjustments take place every six weeks at Mott for the duration of the helmet-wearing period. As you can guess, we’ll post again after his fitting. As of Monday, we are waiting for the out-of-network approval from the insurance company so we can do this at Mott where the rest of his care takes place. Yes, it’s more driving, but they handle everything else so it seems to make sense to continue working with that team. At the helmet fitting, they should also be doing the AFO fitting, so I’m sure the next post will be full of interesting pictures! We topped the day off with a visit to the University of Michigan – Department of Neuromotor Control. This group runs the treadmill study he is a part of and since they see him every other Friday, we figured we would save them the drive to Lansing and do his biweekly visit a day early, at their location. It was Colten’s last day with Dokyeong (I am sure I’m spelling it wrong!). She has been one of the main researchers on the study – very involved, very helpful, and great with Colten. On the treadmill with a smile – this is rare! 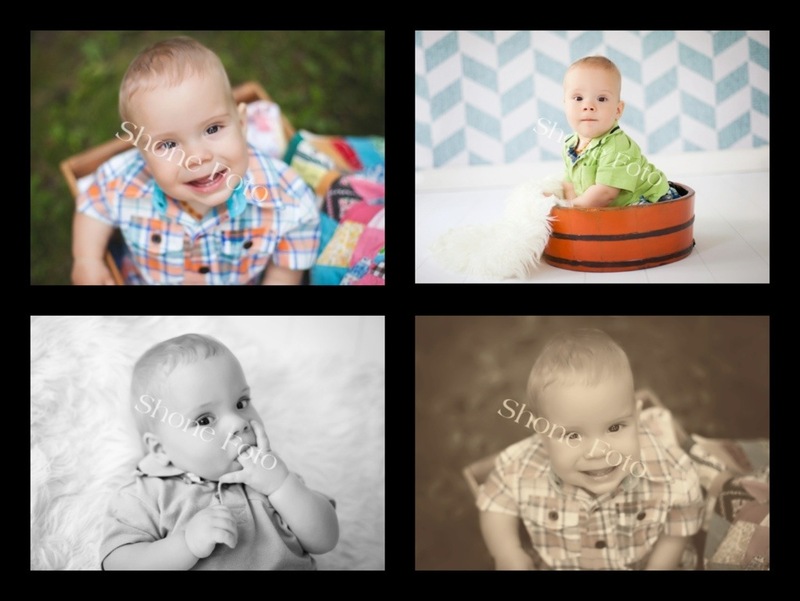 And one last peek at this cuteness… And a special thank you to Shöne Photo (Howell, MI) for donating a wonderful photo shoot to Colten after he was born! Thanks Meg! This entry was tagged AFOs, mott children's, myelo clinic, myelomeningocele, physical therapy, scaphocephaly, spina bifida. Bookmark the permalink. What an amazing report, Katie. Sounds like Colten is progressing nicely and I think those older brothers are encouraging him every step of the way. On another note, how did the interview go for Richard? Hugs and love to all of you. No word on the interview yet… Many more applications still floating out there though. I agree with the others you have such a gift for sharing all the medical terminology so that its easier to understand. 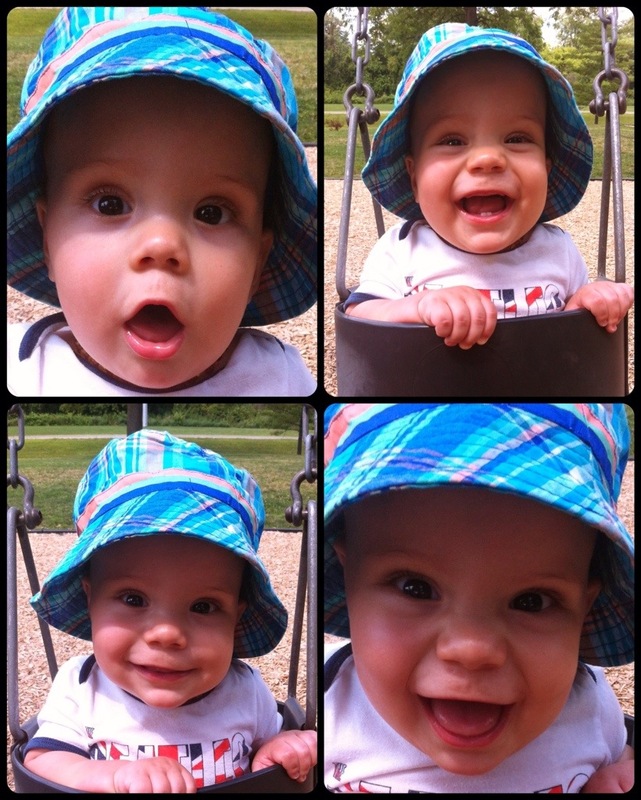 He is such an amazing baby! You and Richard are such great parents! Good luck to Richard with his job interviews.